If you have been following me on Instagram you will know that my husband and I spent the weekend at Niagara-on-the-Lake. Niagara-on-the-Lake is a town in Southern Ontario. It’s known for its wineries and the summer Shaw Festival, a series of theatre productions. With it only being a one and a half hour drive away from Toronto, it makes for a quick, stress free weekend getaway. We usually drive to Niagara-on-the-Lake for the day but this time we decided to stay the night. 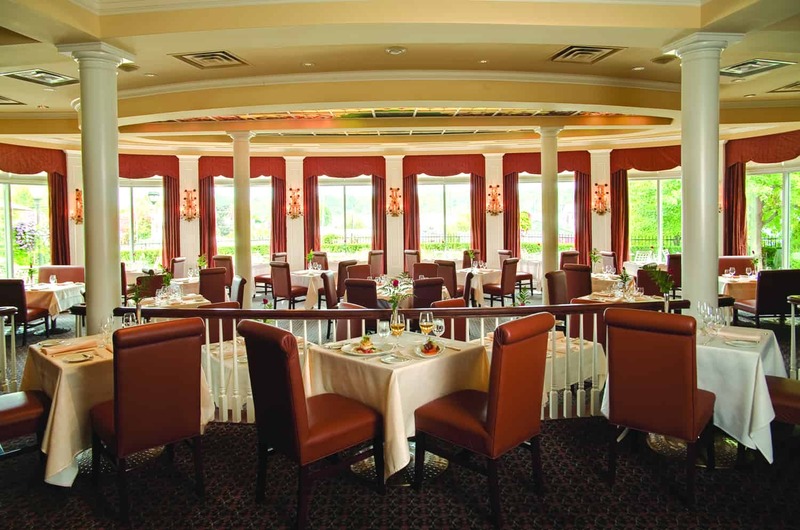 We chose to stay at the Queen’s Landing Niagara-on-the-Lake Vintage Hotels. The Queen’s Landing is a grand Georgian-style mansion with a breathtaking waterfront setting. 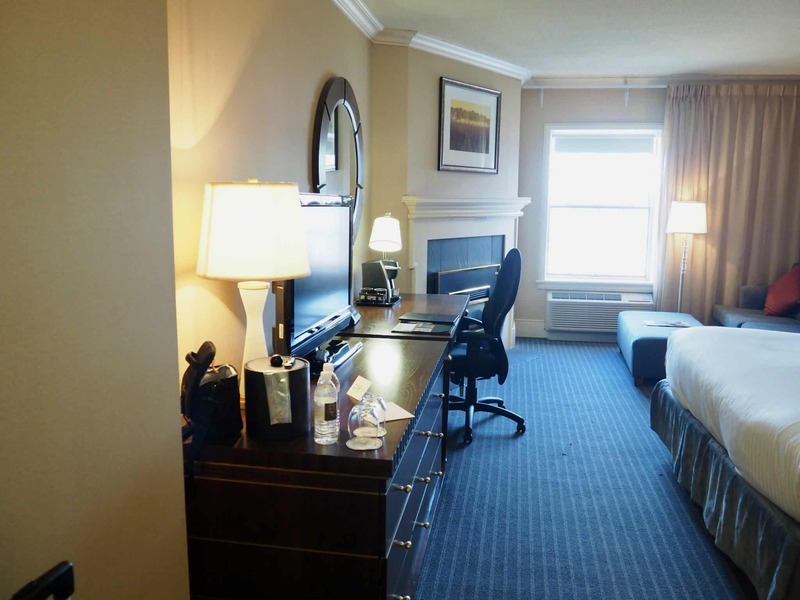 Located at the meeting point of the Niagara River and Lake Ontario, it is an ideal location for a romantic leisure getaway. 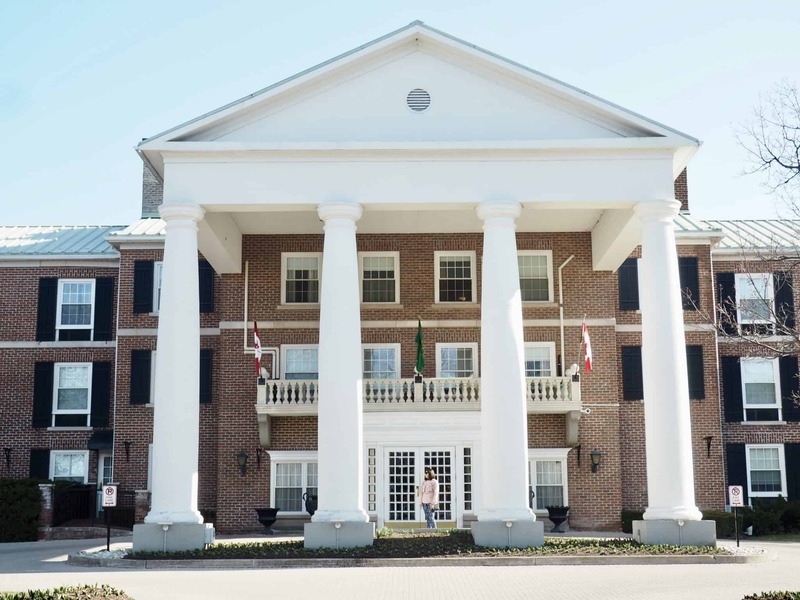 As we entered the property of The Queen’s Landing we were in awe of the large white pillars and Victorian ambiance of the exterior of the hotel. Its architecture reflects the Georgian Era. The exterior features Venetian windows, heavy pediments with mouldings, and large columns. The interior is flooded with natural light, which pours in through floor- to-ceiling windows. 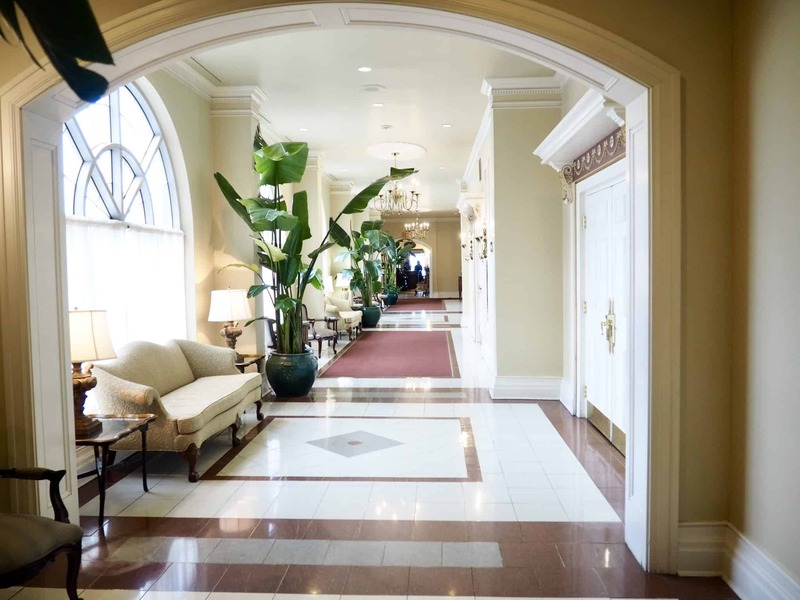 The Scarlett O’Hara entrance is inspired by a sweeping staircase surrounded by marble floors and stained glass accents which define the Queen’s Landing as a mansion with style. 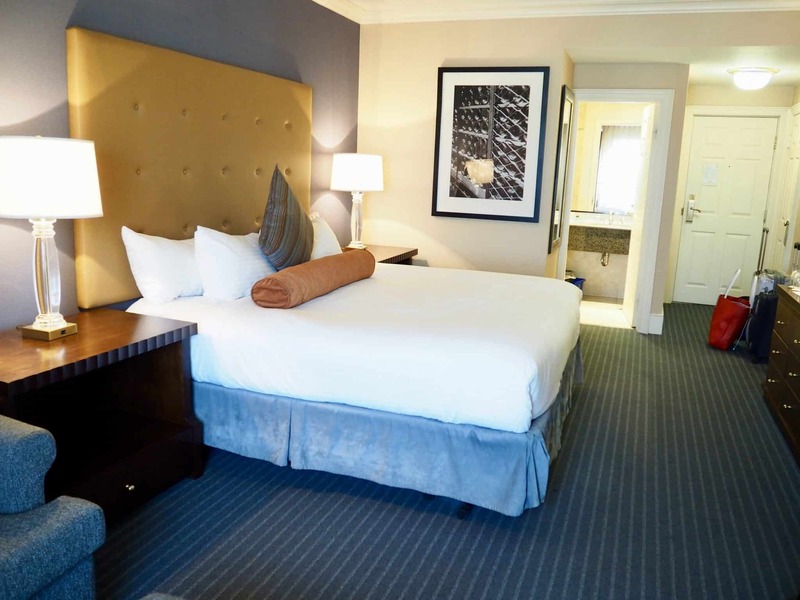 The Queen’s Landing Hotel is part of the Vitange Hotels group that is a collections of Ontario’s Finest Hotels, Restaurants and Spas, in three of the most beautiful areas of the province. 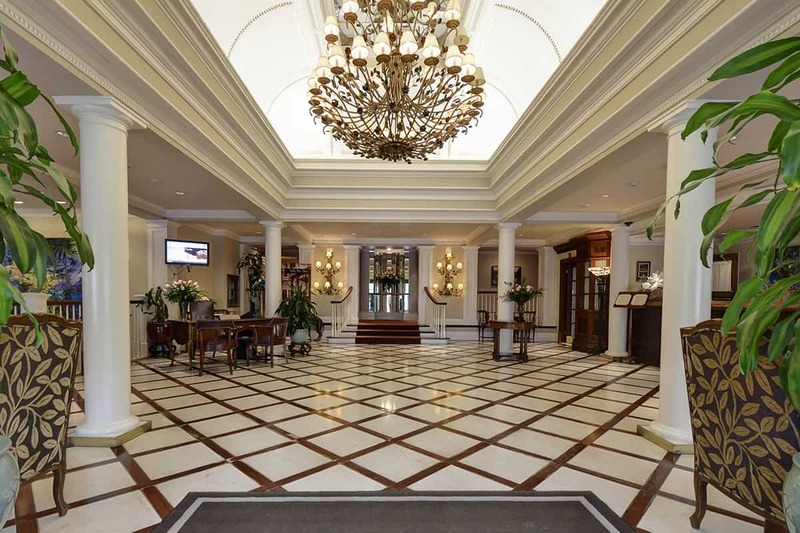 Each Vintage Hotel is unique, down to the finest details, and each guarantees an extraordinary experience. 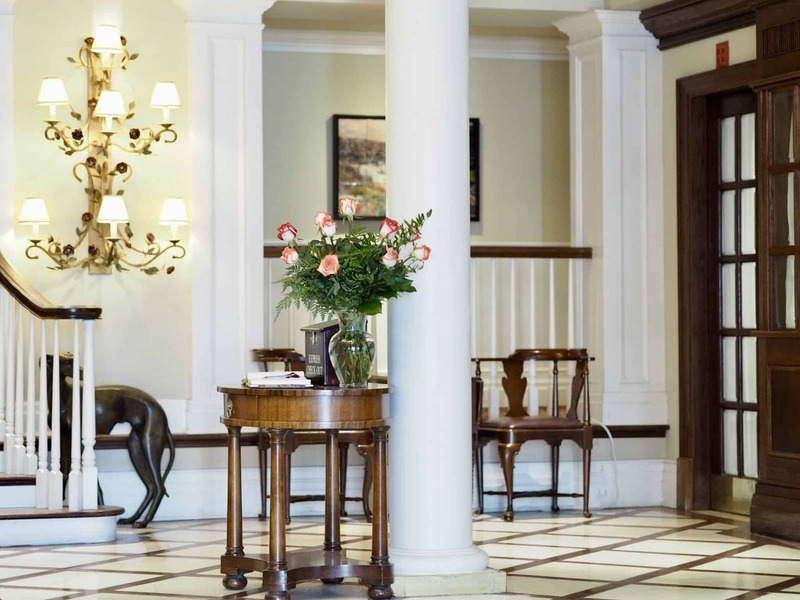 Once you enter the hotel, you are welcomed with a grand entrance that is furnished with victorian style furniture and surrounded by fresh roses. We were checked in within minutes by the friendly hotel staff and we headed straight up to our room. 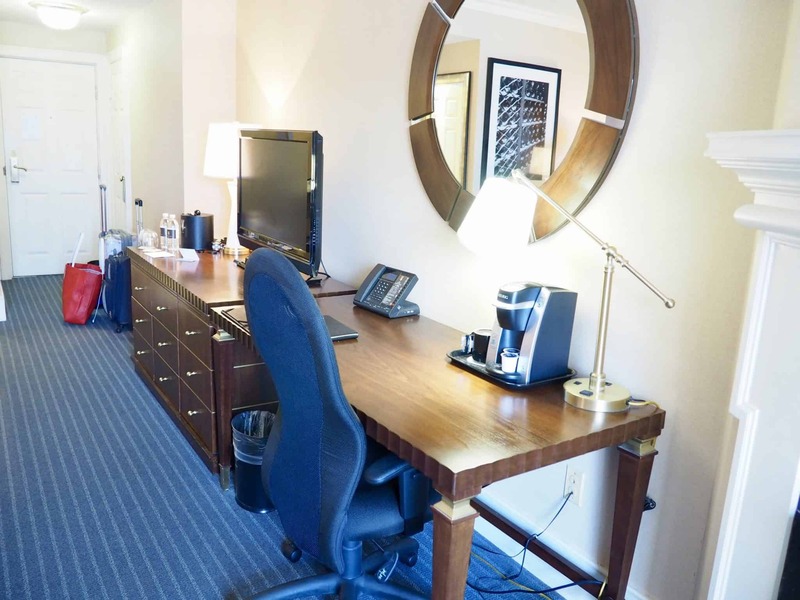 The hotel has 142 guest rooms that are each furnished with luxurious bedding, in-room safes, and high speed wireless Internet access. We slept very well on the plush bed. The beds have a 2-inch mattress pad for that sleeping on a cloud feeling. Our room was equipped with a Keurig coffee machine with coffee pods. I would say that they must of known that we are coffee lovers, but all rooms come equipped with the Keurig. Bottled water is complimentary (most hotels charge for the water). The special touch is the nightly turn down room service that includes a long-stemmed rose on your bed. The hotel room was fairly large and offered a seating area where you can sip on your coffee while lounging on the sofa or watching tv. 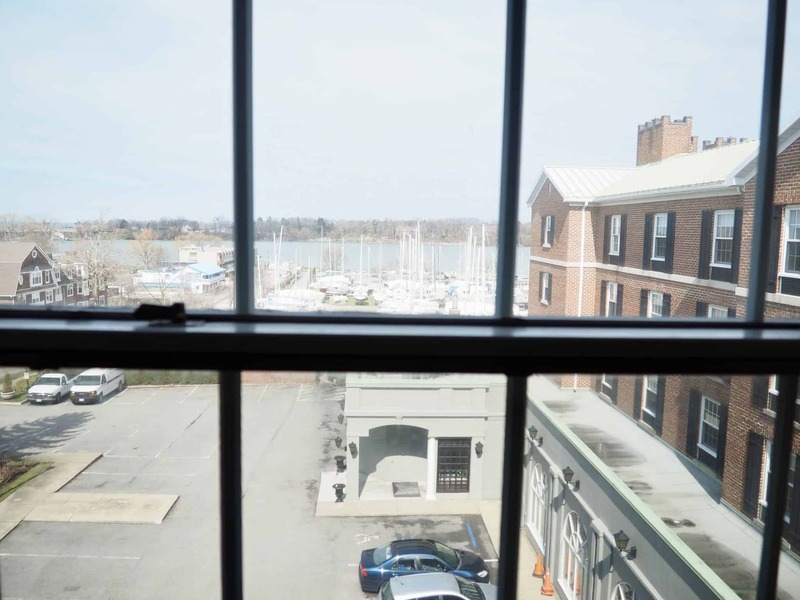 Our room was located on the third floor with a great view of the harbour. I love water views, there is something relaxing about being on the water. I like that the hotel isn’t right on the main strip where it can get fairly busy. 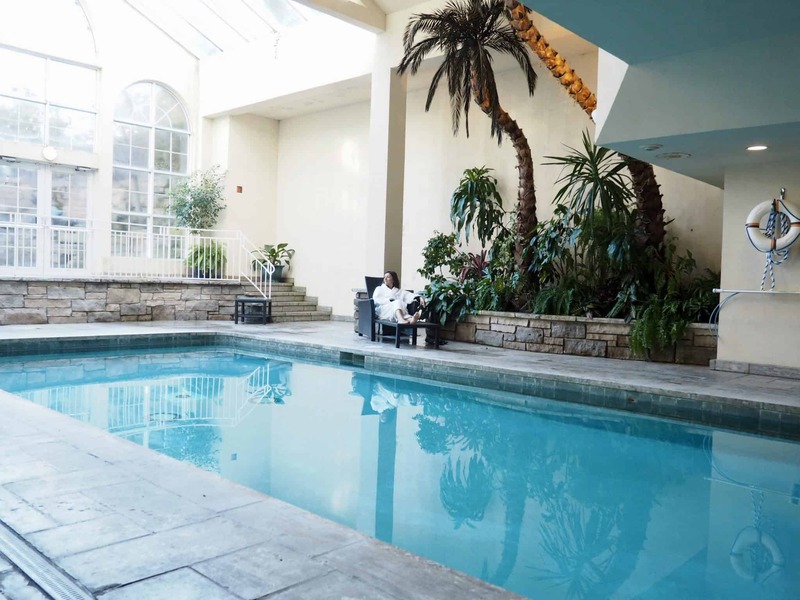 It is just a short walk away from shops, spas and restaurants. 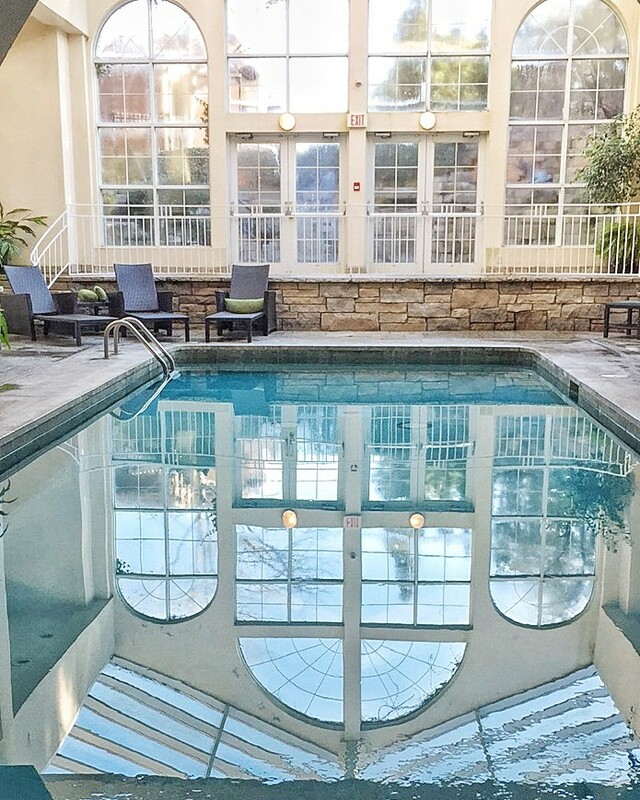 The hotel offers a restaurant, an indoor pool, and a fitness center. Free WiFi in public areas, free valet parking, and a free area shuttle are also provided. With the great lighting in this foyer, we couldn’t resist taking pictures. This is a great location for weddings. There were a lot of couples there checking out the grounds for their weddings. We enjoyed our breakfast in the morning with a view of the marina. 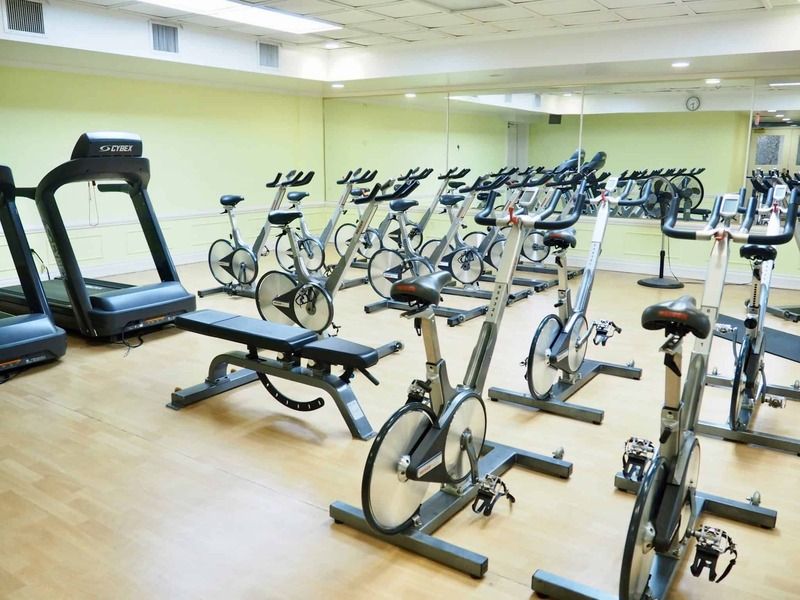 If you are a fitness buff or just want to get in a quick workout, the fitness area offers everything that you will need for your workout. The pool area is so inviting. With the palm trees, greenery and the natural lighting coming through it has a feel of the tropics. As you can see, I was very comfortable and could of easily lounged here all day. 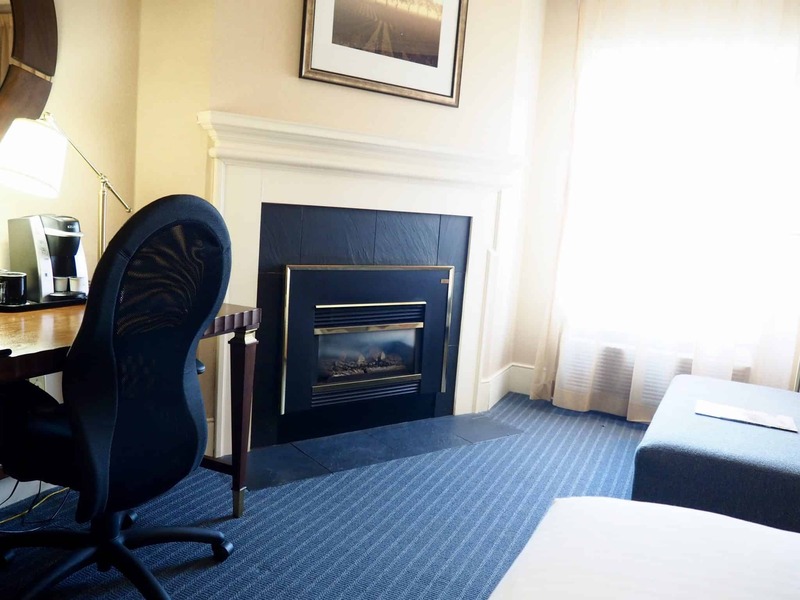 If you are planning an upcoming visit to Niagara-on-the-Lake, I would highly recommend booking a stay at The Queen’s Landing Niagara-on-the-Lake. Not only will you be well taken care of by their amazing staff but you will leave Niagara-on-the-Lake feeling relaxed and rejuvenated (if you didn’t drink too much wine). Thank you Queen’s Landing Hotel for a wonderful stay. So glad you had a chance to unwind at such a lovely place! Thanks for the review. My husband and I have tried all the Vintage Inns except this one and hope to visit it soon! Hi Farheen, it was such a beautiful place – and almost in our backyard! How did you like the other Vintage hotels? I’ve been wanting to go back to Niagara-on-the-Lake. Last time I was there overnight, we stayed at a quaint B&B – this is so much more formal! Yes, I’d imagine this place would be popular for weddings! You need to go – it is beautiful. You will love it. Wow what a beautiful place that entrance photo absolutely blew me away. 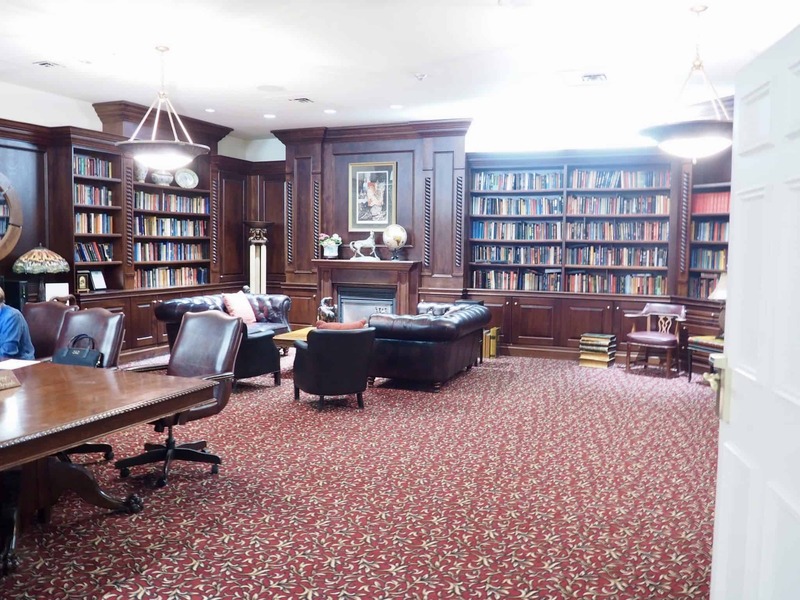 I also lovee that it had a library, something about libraries I love, it just brings me peace. And you are looking sooo fab in that outfit Diana. Those heels are to die for!!! I have only been to the Queen’s Landing once for a wedding, and I absolutely still remember the comfortable bed and pillows! I didn’t even know about the pool or the library! I guess I was just wrapped up in wedding festivities! You will have to go back to enjoy the hotel and experience the pool. This place looks wonderful! I especially love the library! Thanks for the inspiration my darling. The library was wonderful. Thank you for reading. Looks like a beautiful hotel! I love your all blush outfit too – so chic!